Not everyone is happy about former Starbucks CEO Howard Schultz‘s announcement that he is running for president in 2020 as an independent, as one heckler showed Monday night. 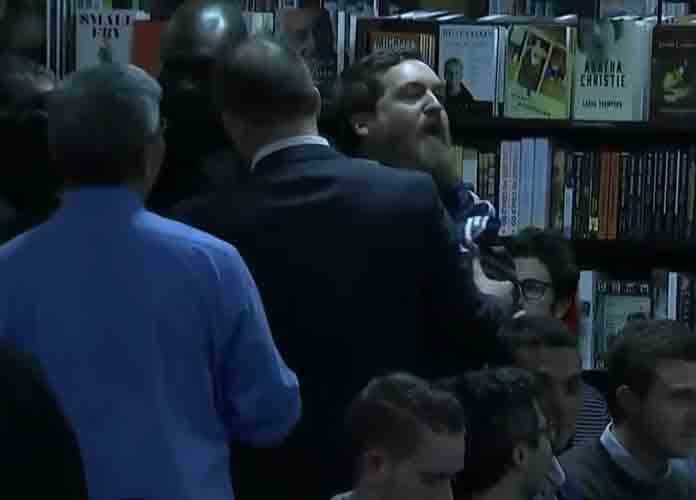 The 65-year-old billionaire businessman was at an event at the Barnes & Noble at Union Square in New York City to promote his new book From the Ground Up: A Journey To Reimagine the Promise of America — which was released Monday — when a man suddenly began yelling at Schultz, whose net worth Forbes estimates at more than $3 billion. “Don’t help elect Trump you egotistical billionaire a—hole!” the heckler shouted. The man was eventually escorted out by security and Schultz continued speaking with the moderator, CNBC’s Andrew Ross Sorkin. Many Democratic officials and other liberals quickly voiced concern that an independent presidential run from Schultz would siphon votes to President Donald Trump in 2020 and thus help him win re-election. The former Starbucks executive said in a pre-taped 60 Minutes interview that he would run as an “independent centrist” because he had grown dismayed with both major political parties. The billionaire also said in an NPR interview that he would hate to see Trump re-elected, and added he believes this could occur if a progressive candidate won the Democratic nomination. Fellow billionaire businessman and former New York City Mayor Michael Bloomberg also weighed in on Schultz’s run, saying he agrees with the dominant opinion that an Independent presidential contender would have little chance at winning in 2020. Trump mocked Schultz on Twitter by saying he didn’t have the “guts” to run against him in 2020.